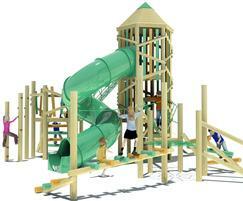 The Zion adventure play tower is designed to create a centrepiece in any playground and is the biggest piece of equipment in Sovereign’s timber range. 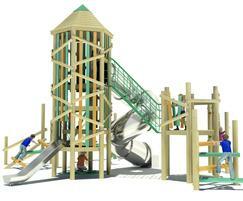 The Zion adventure play tower is designed to create a centrepiece in any playground and is the biggest piece of equipment in Sovereign’s timber range. 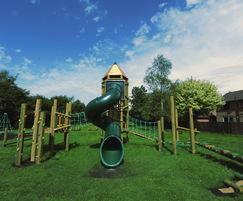 Standing at just over 5.5 metres in height and 11.5 metres in length, it combines multiple activities in one structure and is suitable for children over the age of five - Key stage 1. 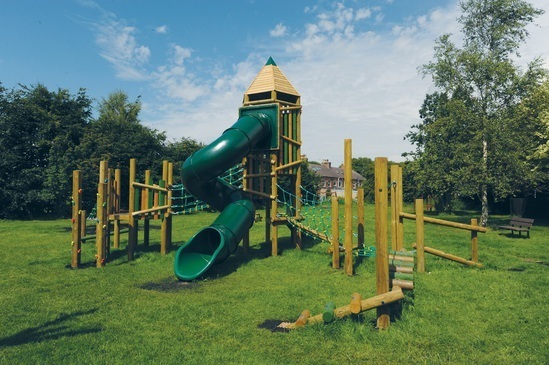 Components include a high sheltered tower deck and two slide options, as well as a spider’s web rope deck, a net tunnel, an hexagonal timber deck and ascending V-shaped bridge, all connected by an assortment of trim trail style beams, walkways, steps and climbing posts. 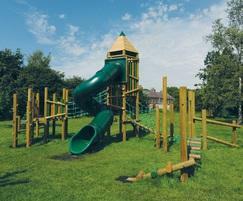 Children can create their own way of climbing up and descending back down the Zion every time they play. The reward for getting to the top is an exciting 360 degree slide, or for those less confident, a smaller slide at the rear with an equally fun descent. As well as encouraging the physical development of children through play, The Zion provides endless opportunities for group interaction and the practice of social skills.